I’m making a special mention of this film’s technical achievements that are noticed even further when viewed in a flawless IMAX theatre. I saw The Dark Knight twice before I saw it in IMAX, and it was easily my best experience with the film. This is, after all, the very first movie to have scenes filmed specifically for an IMAX theatre. 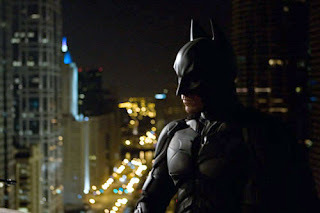 Director Christopher Nolan made a wise decision to produce all of the film’s action scenes in this brilliant quality. Most of the film is reduced to a normal movie theatre screen size by widescreen bars at the top and bottom of the screen. But for the few scenes when the screen fully expands, you’ll be completely jolted. During the opening production logos, the screen was regular format. Then with a subtle BOOM from the soundtrack, the movie opens with that long tracking shot of the side of a building, the five-story IMAX screen maxed to full potential. It was utterly breathtaking. My advice: see the film first in a regular theatre, then go find an IMAX theatre, pay the few extra bucks, and feast your eyes (on ears) on sights and sounds you can’t believe you may have missed. Nolan has said he regrets not filming the entire film with IMAX cameras (it’s hard, he says, because the cameras are so large). But rest assured, for part three, he promises a full IMAX experience. Enjoy.